The number of countries that are included on the golf itineraries of the sports package operators continues to increase. There have always been plenty of European options based in the countries traditionally most popular with British tourists – Spain, Portugal, France and Italy – but these have been supplemented by destinations further east such as the Czech Republic, Latvia and Estonia. The ready availability and frequency of flights to these countries on budget airlines makes them an attractive proposition for those seeking to keep their spending as reasonable as possible. At the other end of the scale are the more adventurous places to unpack your clubs. Again, the United States, Australia, and South Africa have long been countries where the game has been treasured, but look at the offers on some of the sites of internet operators and you’ll find Peru, Argentina, India, Thailand and Mauritius have recently been added to the list. Nobody would ever dispute that golf is a world game, but until recently it was difficult to manage that there would be a market for teeing off on these more unlikely territories. Many of the itineraries may not appeal to serious players simply because they are designed to be at least as much about seeing the landscape and experiencing the culture as digging your way out of bunkers and holing putts. If you are more interested in playing every day than exploring new horizons, then the more unusual destinations probably are not for you. 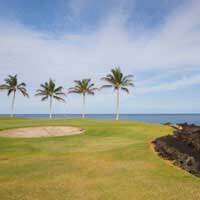 On the other hand, a non-playing partner who is rather resistant to the idea of blowing the holiday budget on a golf package may be easier to convince if they know the upside is exotic scenery – see how Costa Rica or Cuba, for example, grab them. Closer to home, Spain is an obvious choice for the more serious player. Take La Manga (www.lamangaclub.com) in the southeast near Murcia. It combines three championship courses with a wealth of options for partners and kids: watersports, tennis, spa, mountain biking, horse riding, to name a few. And what about France? There are courses across the country. The Evian Royal Resort (www.en.evianroyalresort.com), for example, offers a range of leisure facilities together with four-star hotel accommodation and close proximity to Geneva. You can even take salsa classes. Across the Atlantic in South Carolina, Myrtle Beach (www.myrtlebeachgolf.com), as the name suggests, offers both great golf and the ocean on your doorstep. On the Eastern seaboard, Florida is another favourite destination for lovers of the game. Further west, the area around Phoenix and Scottsdale, known as the Valley of the Sun, can boast great facilities and superb Arizona landscapes. Returning to the more exotic market, it is worth mentioning that both Beijing and Shanghai are now included on golfing itineraries of China. The country is reputed to boast around 200 courses in total. It seems that while the Great Wall has successfully repelled invaders for thousands of years, even its most imposing fortifications have been unable to resist the more benign yet equally powerful force of golf from sweeping across the nation.